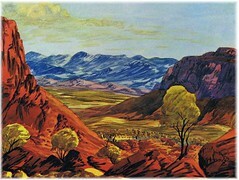 Central Australian Landscape, watercolour by Ewald Namatjira (1930-1984). Blackwood Uniting Church does not have a mission and justice committee. Instead it has a large number of committed people doing mission and justice work and a small Coordinating Group. Our mission and justice work is focused in three areas, each area having local and global aspects. Justice Focus: Solidarity with disadvantaged and oppressed people, peace in the world and our own community, and reconciliation with Aboriginal people. Environmental Focus: A sense of justice for all creation in a world that has been exploited and damaged. Partnership Focus: Living a caring and sharing faith through contemporary mission that includes work with partner churches and partnerships with other groups beyond our congregation. The pursuit of peace is at the core of what it means to be disciple of Jesus Christ. We echo his words when we share the greeting, “Peace be with you.” Jesus expresses the centrality of peacemaking in the Beatitudes: he preaches that peacemakers are children of God (Matt 5:9). Jesus’ peace depends on Justice. To remain passive in the face of exploitation means increasing injustice. We seek just change through our engagement with the wider community, our commitment to inclusiveness, and to solidarity with aboriginal peoples. Peace means Environmental harmony. We understand God’s creation as an integrated whole, where we work to live in harmony with the natural world, conserving diminishing world resources. Peace means working in Partnership. It means embracing community in a ‘global village, responding to the needs and deep dreams of our partners in the developing world, supporting partners in Christ’s mission in this local community and acting in unity with the wider Australian church. Deep peace of the Son of peace to you! To see a complete list of the projects in each of these focus areas, please click here to go to our Mission & Justice Overview page.